Hascall F. Bixby, 91, Dies at Burlington, Vt.
Was Oldest Member of Roberts Post, Serving With Co. I, 5th Vt.
Hascall F. Bixby, 91, the oldest member of Roberts post, GAR, died yesterday morning at Mary Fletcher hospital in Burlington, Vt., following an operation, performed Tuesday afternoon. Mr. Bixby, who had resided during the past few years at the home of his son, Frank E. Bixby, on Sheldon Place, Rutland, was born January 19, 1837 in Shrewsbury, Vt. He lived in that town until 1902, when he moved to Rutland. 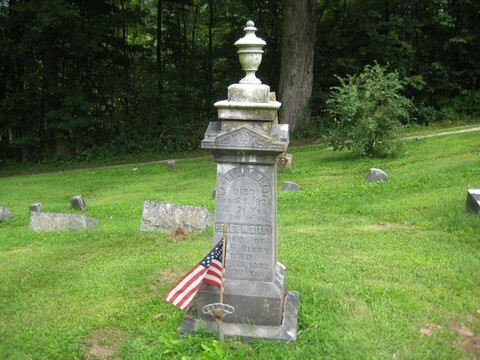 On September 6, 1861, he enlisted in Co. D. Fifth Vermont Infantry at Burlington and on September 16, went to St. Albans, Vt., where he was mustered into service,leaving there on September 21 for Virginia and the war. In the Peninsular campaign, which was one of the most bitterly fought struggles of the war, he was an active figure and in the Battle of Antietam he sustained a wound in the shoulder, which sent him to the hospital. He was discharged from the service, January 28, 1863. 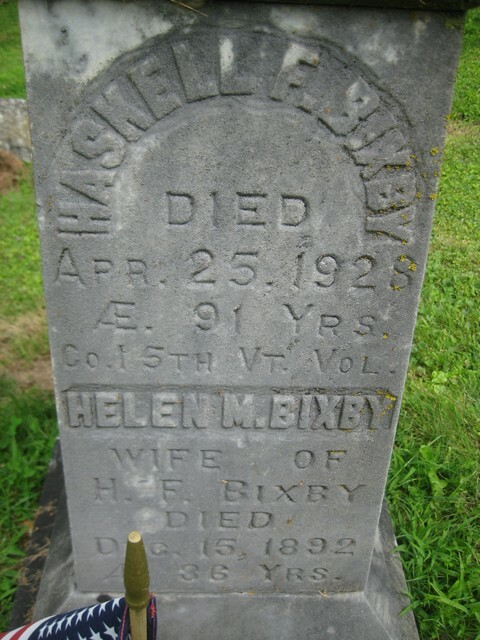 For 30 years Mr. Bixby was employed as section foreman by the Rutland Railroad, serving 16 years as foreman of the gang at Cuttingsville, Vt. Until his last illness he was hale and hearty and retained his faculties to a remarkable degree. He is survived by three sons, Frank E. of Rutland, V., Clarence of East Wallingford, Vt., and Ollie of Bellows Falls, Vt., one daughter, Mrs. Estella May Butterfly of Rutland, 18 grandchildren and 12 great-grandchildren, The funeral will be held Friday afternoon at 1 o'clock at the home of his son, Frank on Sheldon Place, Rutland, with burial in Laurel Glen cemetery, Cuttingsville, Vt. Roberts post GAR, will have charge of the service. In January, 1927, Mr. Bixby was host to the members of Roberts post at a party, held in the GAR hall to celebrate his 90th birthday and on his last birthday he entertained his comrades at the home of his son, Frank. Military Record: BIXBY, HASKELL, Burlington, enlisted 9/6/61, mustered in as Private, Co. I, 5th Regiment, Vermont Volunteers 9/16/61; discharged for disability 1/17/63. Source: Rutland, Herald, April 26, 1928; Revised Roster, p. 171. Contributed by: Joan Humphreys Bixby, whose husband is Hascell Bixby's great-grandson.